Lining up before the Lincoln 10k. 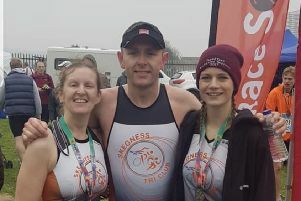 Thirteen Skegness Coasters ran one of Lincolnshire’s most popular and picturesque charity road run events, the Lincoln 10k. The route was mainly flat with a few gradual inclines. Runners at the Gainsborough and Morton 10k. It started outside Yarborough Leisure Centre, the route taking in the majority of the roads around uphill Lincoln near to Bishop Grosseteste University College, Lincoln Castle and finishing near to Lincoln Cathedral. Janet Harmston was the first female veteran over 60 over the finish line. There were personal bests from Carl Clark, Alex South and James Porter. “It was perfect running conditions, no wind or rain and not too hot,” said Alex. Results: Carl Clark 41.47 PB, Janet Harmston 49.48, Alex South 49.51 PB, Peter Fulwood 57.37, Julie Hawkesford 58.44, Debbie Cussons 59.41, Emily Avison 1:05.38, James Porter 1:07.18 PB, Tracy Sands 1:07.18, Sharon Cooper 1:07.18, Emma Dewey 1:11.18, Rebecca Sylvester 1:28.00. 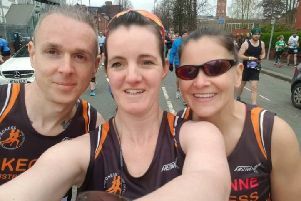 Martin Jessop participated in Manchester Marathon this weekend. The route took him on a three-mile loop of the city centre, showcasing some of the city’s most iconic landmarks including the Manchester Opera House and the Albert Memorial Hall. Martin finished the marathon in 4:17.24. Nine club members took on the Gainsborough and Morton 10k, which starts in the village of Morton. Coaters at the Tealby Trail. It was a fairly flat, rural route taking in the villages of East Stockwith and Walkerith. Janet Harmston was the second female veteran over 60 at the event. Results: Carl Clark 43.00, Janet Harmston 51.24, David Young 54.32, Debbie Cussons 1:01.10, Julie Hawkesford 1:01.12, Andy Wilkinson 1:04.26, Claire Parker 1:18.31, Mark Shaw 1:20.52, Les Arrowsmith 1:23.17. The Tealby Trail Run is an 8.7-mile scenic route taking in varying hills. Results: Carole Tumber 1:39.59, Benjamin Peel 1:42.00, Martin Jones 1:43.00, Helen Kennedy 1:44.00, Ian Bailey 1:44.00. The Hull 20 is a 20-mile, flat race using rural roads and part of the railway line located in the Holderness area. Robert Rennie and Jackie Rhodes took part in the recent Notts 20 event. Results: Robert Rennie 2:31.00, Jackie Rhodes 3:27.00.